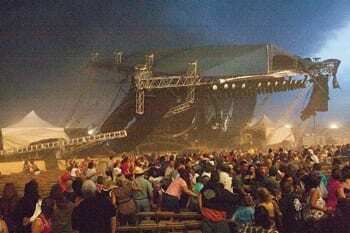 The Indiana State Fair stage collapse. Country duo Sugarland, concert promoter Live Nation and 16 additional defendants have reportedly reached a settlement with victims of a stage collapse during the band’s performance at the Indiana State Fair in 2011. The collapse killed seven and injured nearly 100. Thirty-nine million dollars will be paid out based on the severity of injury. Each defendant’s financial contributions are confidential. A previous $11 million settlement was made with the state, with some plaintiffs refusing to accept. Attorney Kenneth J. Allen confirmed this latest mediation involves all victims, however one defendant, ESG Security, is not included and may eventually go to trial. The lawsuits against all other defendants were dismissed Friday, Dec. 19, Allen confirmed to Tammy Webber of the AP. Since the collapse, two investigations reported the rigging did not meet industry safety standards and fair officials did not have a proper emergency plan. As a result of the findings, new regulations have been made and relatively minimal fines were issued, the largest of the first investigation was $63,000.